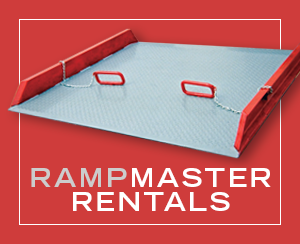 Rampmaster’s Stationary Steel Yard Ramp will eliminate those difficult and time consuming shipping and receiving problems. Ideal for those companies that do not have docking facilities or just need additional space. Easy to install, they can be moved to another location when necessary. 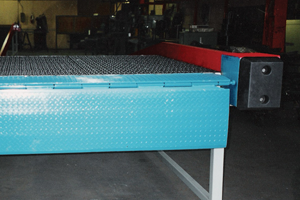 Ramps are available in various lengths, widths, and capacities. The lead-on section of the ramp is steel treadplate, the main deck is all-weather open serrated steel grating. All ramps are custom made to your specifications with all surfaces painted to reduce rust and to give your ramp a pleasant appearance. 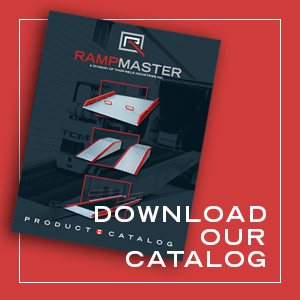 The Stationary Steel Yard ramp comes with a six foot level off section allowing a forklift to level out before entering the truck and picking up the pallet. The edge of dock in the down position and the six foot the level off section enabling a forklift to enter a truck with the forks parallel to the floor. The optional edge-of-dock feature bridges the transition from the ramp into the truck. 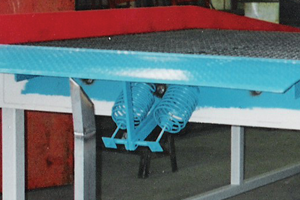 A mechanical torsion spring lift assist allows operation by one person. 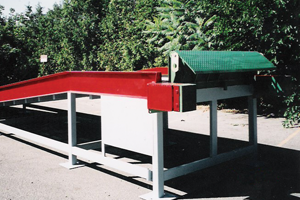 The bridge permits access to trucks 3” – 4” higher or lower than the ramp and comes complete with bumper blocks.